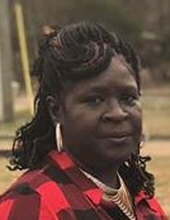 Annette Brown-LeMay, 51, of 457 Lemay Lane died February 4, 2019 at Maria Parham Health. She was born in Vance County to Joseph Lee Brown, Sr. and Classie Mae Perry Brown. Survivors include her husband Jerry Lee LeMay; children: Jerry LeMay, Jr., Jer’Darious LeMay and Barbara Perry; three grandchildren, one great-grandchild; mother, Classie Brown; and siblings: Willa Jean Brown, Loretta Brown and Joseph Brown, Jr.
A funeral service will be held at 1 pm, Thursday, February 14 in the chapel of Davis-Royster Funeral Service. Interment will follow in the Mitchell Baptist Church cemetery. Viewing will be from noon to 6 pm, Wednesday, February 13 in the funeral home chapel. The family is receiving friends at 342 LeMay Lane. Arrangements by Davis-Royster Funeral Service. To send flowers or a remembrance gift to the family of Annette Brown-LeMay, please visit our Tribute Store. "Email Address" would like to share the life celebration of Annette Brown-LeMay. Click on the "link" to go to share a favorite memory or leave a condolence message for the family.